Lance Friedman is a math major who has been tutoring students in the North Shore of Chicago for 10 years. In addition to teaching all topics (from fractions and algebra to statistics and calculus), He provides math enrichment, assists with ACT/SAT prep, and creates puzzles and webcomics. A plane isn't a plain name. A plane is quite useful! See travel photos with Norway the Husky and Oscar the Dog! Goal: Walk 2020 miles in one year (before January 1, 2020). Mission: To remind or inspire others to get out and walk a dog! The best math resource in the North Shore of Chicago! If you have questions, suggestions, or requests, let us know! Math Plane is a place for students, teachers, tutors, and visitors to find free notes, practice tests, comics, and other cool math items. Although we're not in it for the money, any donation is greatly appreciated! First, and foremost, we value the privacy of our visitors. Mathplane.com is the sole owner of any information collected from this site. (The email and contact messages include information that you provide us.). We will not sell, share, or rent this information. A "cookie" is a delicious piece of data stored on your computer containing information about your visit. Usage of a cookie is in no way linked to any personally identifiable information while here. We may use third party advertising (such as Google Adsense) to serve ads when you visit our website. These companies may use information about your visit to this and other sites in order to provide ads about goods and services that interest you. This website contains links to other sites. Please be aware that mathplane.com is not responsible for the privacy practices of such other sites. You are allowed (even encouraged) to print content from the site for your private, non-commercial use. ​Share it with your friends, use it in the classroom, or add it to your blog or website. But, please don't take credit for it. That's not right. ​Request: Let us know if you find the content useful. We appreciate feedback! You are welcome to link to this site or pages in the site.​ ​​However, you may not display content from Mathplane framed within your website or any other. (or, present the content in any manner that gives the impression that it is not from Mathplane.). In other words, links must open ​in a new window or on top of the page containing the link. ​Request: if you'd like to link to the site, let us know! 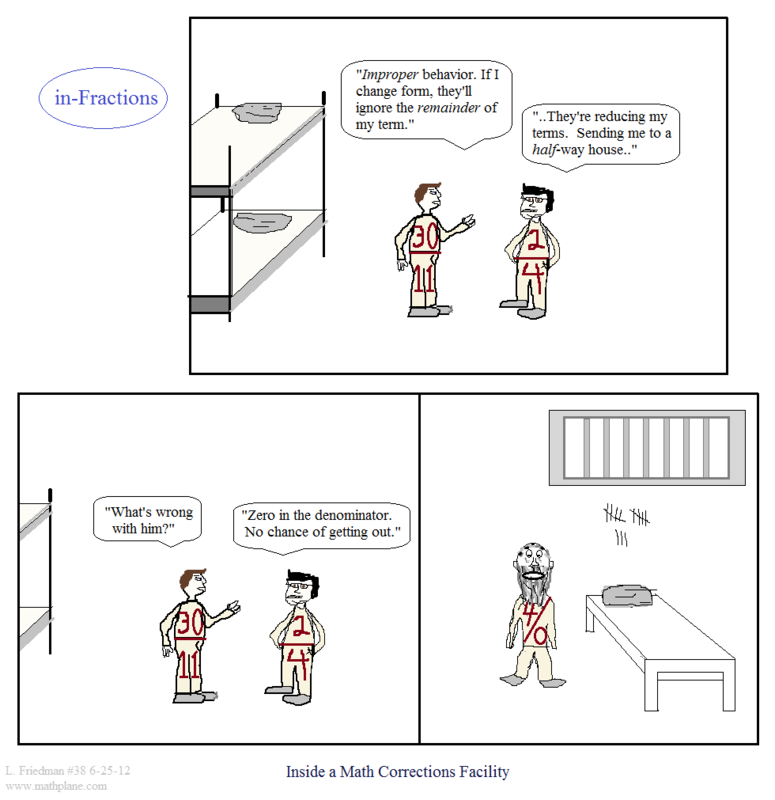 The weekly math webcomic is the original work of Lance Friedman. ​You are free to share a comic or use it for a non-profit organization. ​Please do not edit, crop, or erase any parts of a comic -- particularly ​the name, ID, date, and mathplane.com signature. ​Give credit where credit is due! ​Request: Let us know if you found a comic entertaining, applicable, or useful -- or, where and how it will be implemented. ​If you'd like to use a comic for marketing, commercial, or paid ​advertising purposes, please contact us for pricing and terms. The content of this site is provide "as is", and your use of this content is not guaranteed -- including successful course completion or satisfactory grade. Lance Friedman assumes no liability which may result from use of this website (or any third party advertiser). Here is some linking information.